3D CAD technologies have drastically changed throughout the last few decades. While early CAD designs were limited to 2D drafting, the technology has evolved into something more complex and useful. Users can develop 3D CAD models involving large volumes of data within the design elements. Due to this, designers and engineers can gain deeper insights about how their projects will function, look and behave when they are completed. Furthermore, CAD technology is evolving at a rapid pace. The realism of CAD designs is limited by a display which CAD software utilizes, which involves displaying a 3D design on a 2D screen, which does not provide an accurate description of the 3D CAD model. So how can we solve this problem? 3D CAD designing in Melbourne can bring 3D CAD models to life using augmented and virtual reality. Earlier, virtual reality and augmented reality systems application had been limited to the entertainment and the gaming industry. 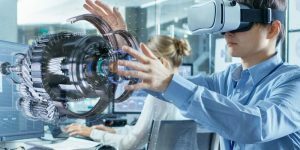 However, with the evolution in 3D CAD technologies and virtual and augmented reality technologies, designers and engineers are able to witness the application and advantages of virtual reality in 3D CAD modeling. 3D Drafting contractors can view their projects in 3D with the aid of VR technologies. It enables them to visualize the appearance of their designs and how they will appear at scale when compared with other similar virtual objects. However, virtual reality technologies are not only about upgrading existing technologies but also about adding new features and functions, which were non-existent and unimaginable earlier. Imagine, if a CAD engineer in Australia could walk you through a virtual building or a virtual product even before the design has been conceptualized into a physical model. You can even break apart these virtual models into individual pieces which would be practically impossible in real life. This can help businesses reduce the cost involved in prototyping and reduce to cost of production. Also, customers no longer need to wait for a long period for a physical model for design approval. It is easier and faster to approve designs on CAD designs by simply viewing a product in a virtual reality environment. This offers a wide array of opportunities in multiple fields such as engineering, architecture, product design and development and much more. With virtual reality making inroads into CAD designs, there is scope for much more exciting improvements and developments. Imagines, engineers being able to conduct structural analysis in VR instead or change the way by which consumers related to their products, i.ee changing the emphasis to ‘story living’ from ‘storytelling’ and offer a high degree of realistic interactivity at the same time.